2. (STARS AND STRIPES) Digital Military News. Click link in caption for the most recent issues. Subscribe to the Port of Palm Beach Post! Subscribe to the Port of Palm Beach Post!!! United States Air Force ditty two airmen. (CLICK HERE FOR THIS COMICAL ENTERTAINING RENDITION). Remember to subscribe to the Port of Palm B each Post! With Hagel out, who might lead the nation’s military? The Obama administration will likely be looking at a few top candidates when considering a replacement for Defense Secretary Chuck Hagel, including some former top Pentagon officials and lawmakers with expertise in military affairs. A grand jury declined Monday to indict police officer Darren Wilson in the death of Michael Brown. The Islamic State group which controls a large swath of Syria and Iraq has received between $35 million and $45 million in ransom payments in the past year, a U.N. expert monitoring sanctions against al-Qaida said Monday. Port of Palm Beach Post shared a link via Rex Martindale. Jason Redman was critically wounded in a fierce firefight in the Al Anbar province of Iraq in 2007. He almost bled to death that night, thousands of miles away from his family, and friends. 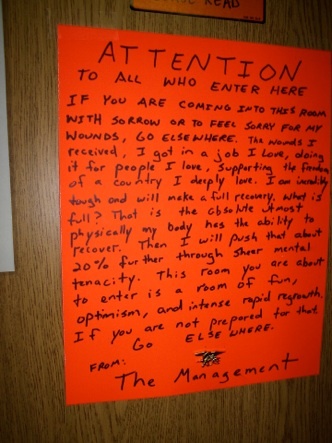 The note he hung from his hospital door during his recovery vent viral, and inspired many. The Trident is his story. I started reading Jason’s book on my way back from Poland. I had just finished a quick visit with some of our Special Ops GROM brothers, and cracked open the book on the long flight home back to Manhattan. I found it hard to get through the first couple of pages. This was not because of the writing, it’s very well written. It was difficult because of the long, sobering list of names he placed upfront, a list of all the SEALs lost since 9/11/01. It hit me in the face like the icy winter waters of the Pacific ocean and sent chills down my spine as I sat in 40D. I paused, staring off into blankness long enough for people to start looking at me funny, then I snapped back in and read on. I’ll be honest with you, I secretly wished I didn’t know any of them. It would be easier to not know them, just acknowledge their bravery and read on. Robinson, Retzer, Campbell, Axelson, Lee, Tumilson, Dietz, Murphy, Suh, Kyle, Freiwald and many more, all men I knew well, brothers, my generation of Team Guys, all gone. Fast forward a week and as I was finally getting around to writing this review, my oldest son was sitting next to me. He looked over and asked, “What are you writing dad?” I told him that I was writing a book review for SOFREP. “Is it a good book,” he asked. I told him that is was a great book, and then told him I loved him. I plan on letting him read it next. I can’t help but think about how many of my SEAL brothers will never again have an opportunity to hug their kids and tell them they love them. My only solace is knowing that they died with their eyes wide open, doing something they loved and cared deeply about. We should never forget them, and books like The Trident ensure that their memories continue to live on in story. When you read Jason’s book you’ll know that he is extremely lucky to be alive today. Jason has an amazing wife, family, and network of friends that served as his foundation during his multi-year recovery. Learning about his long road to recovery reminded me how important these people are in our daily lives, and how I should appreciate them more for it. The people we surround ourselves with matter, and we are who we hang out with. I’d hang with Jason Redman any day. If you are coming into this room with sorrow or to feel sorry for my wounds, go elsewhere. of a country I deeply love. I am incredibly tough and will make a full recovery. Every now and then a book comes along and you know it’s in a special category. The Trident is such a book. Read it, you’ll be a better person for having done so. We link to other websites if we find their content compelling. We also link to relevant products on Amazon.com as affiliates. The money we earn from Amazon helps keep the beer cold and the lights on. Brandon Webb is a former U.S. Navy SEAL with combat deployments to Afghanistan, and Iraq. His proudest accomplishment in the U.S. Military was when he was a Chief Petty Officer & Course Manager for the US Navy SEAL Sniper program, arguably one of the best sniper programs in the world. He is Editor-in-Chief of SOFREP.com and a New York Times best selling author (The Red Circle & Benghazi: The Definitive Report), and his writing has been featured in print, and digital media worldwide. Follow him on twitter.